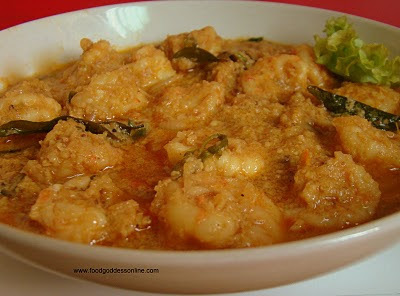 Andhra coastal (seafood) delights consist of fiery gravies laced with fragrant spices.One such dish is the coastal prawn curry.You could reduce the spice further to give it a milder taste. Happy New Year, and a great Sankranti(Pongal).Thanks for all my blog mates who sent me their good wishes. In a glass bowl mix all the spices and prawns,chopped tomato, season with salt and keep aside. Saute the onions till golden in color.Add the curry leaves, marinated prawns and toss around for a minute then add 1/3 cup water and let it cook till prawns are done.Always remember over cooking results in loss of flavor and nutrition.Garnish with the fresh coriander leaves. Its been so long since I had some fresh prawns. The curry looks yumm. Do you suggest me tiger prawns/jumbo prawns or the medium sized prawns for this curry?